A 3D modeling tool to help surgeons plan out the best surgical procedures before operating on patients. A smart shoe insole that optimizes lower-extremity rehabilitation. Redesigned surgical drains that can be placed under incisions to remove tumors. At UC San Diego, the fields of engineering and medicine aren't just merging in research labs, they're merging in the classroom as well. The Jacobs School of Engineering offers the “Clinical Bioengineering” course, in which engineering undergraduates shadow physicians, learn about problems in their clinical practice, and develop engineering-based solutions to bridge the gap between the bench and the bedside. In some cases, students have even obtained funding to turn their solutions into reality. The course reflects the UC San Diego Institute of Engineering in Medicine's mission to connect engineers with physicians to find innovative solutions to clinical problems. Clinical Bioengineering is taught by Adam Engler, PhD, Professor of Bioengineering. He adapted it from his alma mater, the University of Pennsylvania, where he was part of the first cohort of undergraduate students taking a version of the class. UC San Diego was the second institution in the U.S. to implement a class in which engineering students shadow physicians as they visit patients, perform surgeries and diagnose disease. “It’s great to see how clinical problems can be resolved with their ideas,” says Deborah Watson, MD, Professor of Surgery in the Division of Facial Plastic Surgery, who is one of the clinician mentors for the course. Watson’s practice involves performing nasal reconstructions to help patients who have difficulty breathing through their nose. To prepare for some of these procedures, she’ll examine CT scans of a patient’s nasal structure and plan out what framework elements need to be modified or removed in order to increase airflow. When meeting with students from the Clinical Bioengineering course, Watson would go through these scans in detail and explain how she would make changes to the nasal anatomy and what the resulting airflow would look like. She’d float around an idea—how about designing a way to make patient-specific models of the airspace in the nasal cavity? Thomas enrolled in the course because she was interested in applying her mechanical engineering background to medicine. For the final project, Thomas and a classmate, bioengineering alumnus Jonathan Gan, developed a 3D modeling tool to quantify the change in the nasal airflow before and after nasal surgery. Their tool first creates a 3D digital reconstruction of a patient’s nasal airway passages using CT scans. 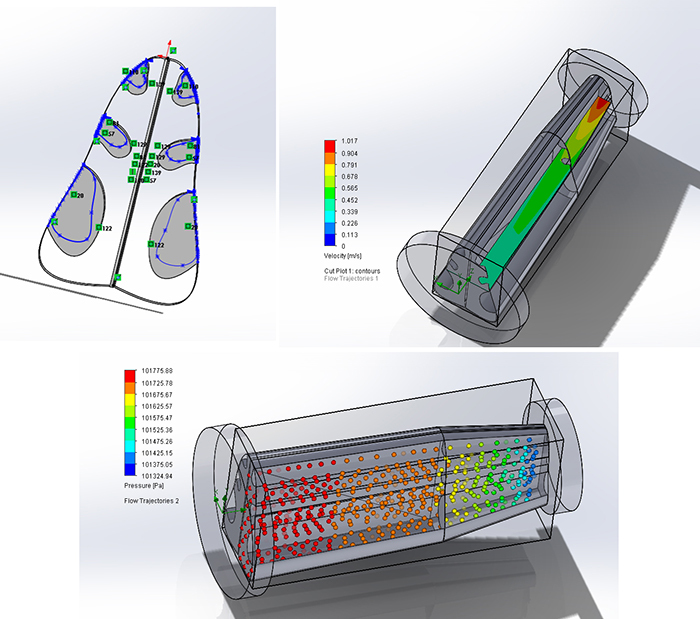 The user then alters this reconstruction, and the tool uses fluid flow models to show where and how much the airflow had changed.